At 40 minutes from the city of Cusco at the eastern end of the Sacred Valley of the Incas is the small town of Pisac, and for a time its popularity has grown enormously, not only thanks to its archaeological complex, but also to its Beautiful craft market; But why is the Pisac market so popular? And what can be found there? Even during the Inca empire 600 years ago, the area of Pisac had great agricultural importance; The fertile lands of the valley, bathed by the Urubamba River and the terraces built in the mountains, were used to grow maize, quinoa, potato, kiwicha, etc. During the conquest and like other Inca cities, the Inca city of Pisac was destroyed in early 1530; The present city of Pisac was built in the valley by orders of Viceroy Toledo in the 1570s. The chronicles of the conquest show that the main square was not long in becoming an important commercial area and then in the market that today In day is known. Today, the Pisac market is a sea of wooden posts placed at random and very close together. Most of it, is located in the Plaza de Armas de Pisac, but extends to the small streets to the surroundings. During the week the Pisac market is much smaller, and in most cases you can only find handicraft sellers; However, the market is much larger on Sundays; Sellers come to occupy up to the last available inch; On this day you will also find food stalls, organic fruits and vegetables grown in the valley; And even some stalls with strange concoctions, used since the time of the Incas. 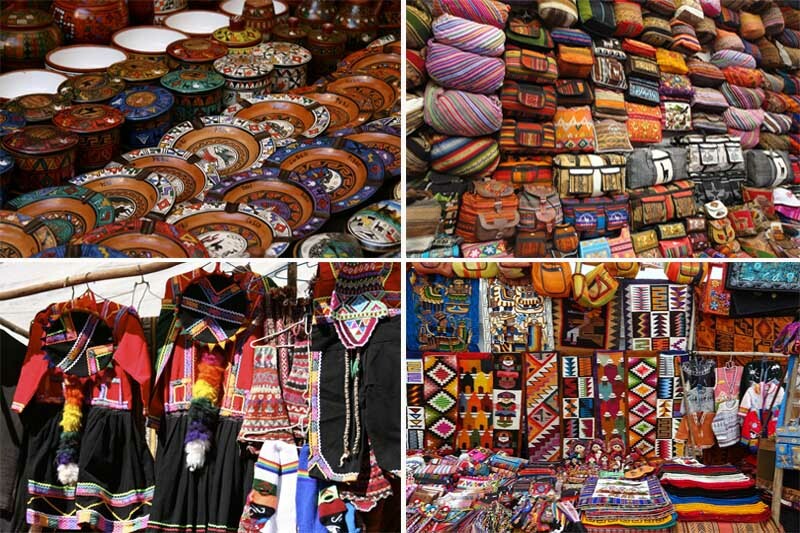 The artisan section of the market is full of articles related to the Inca culture, it can be the ideal place to buy gifts and souvenirs. 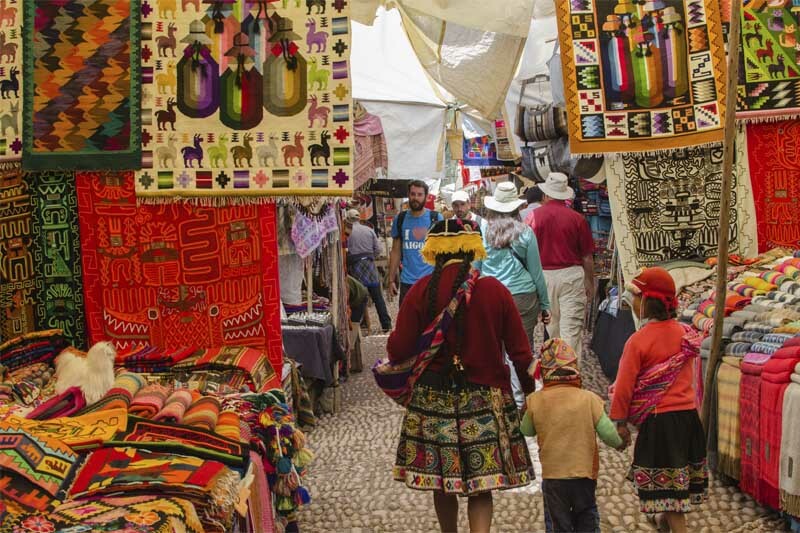 You will find hand woven products of fine alpaca fiber and some unique pieces of jewelry, remember that in this market is allowed to haggle. Take your time to tour the food section; Most things look wonderful, but be careful, not all stalls are so hygienic. 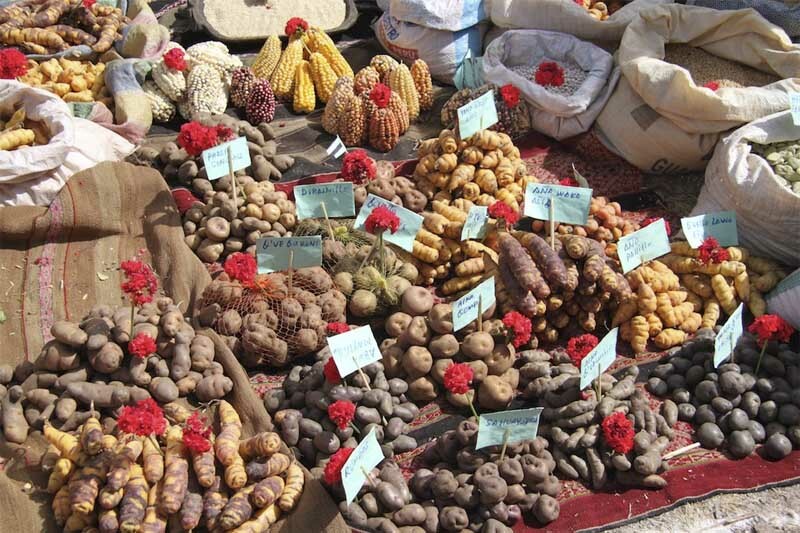 You can find native and organic products, such as native potatoes, corn, “rocoto”, a very spicy pepper species; Try also Pacay, an “unusual” fruit, on the outside it looks like a huge pea, with a sweet, refreshing and delicious white fruit, which resembles a piece of cotton. If you are not traveling through Pisac as part of an organized tour and want to visit the Pisac market on your own, all you have to do is take a taxi from anywhere in the city of Cusco, and tell him to take you to the street Puputi, from this place cars, buses and minivans depart for Pisac, prices vary between 4 and 7 soles. But if you want to travel more comfortable, you can negotiate a taxi, this could cost between 30 and 50 soles. To make the most of your time, you may want to incorporate in your tour the ruins of Pisac. You can walk from the Plaza de Armas de Pisac, you can find the way by asking people and going on your own; It is a very small town and it is very difficult to get lost. The archaeological complex of Pisac and of course, its market, are the places not to be missed on your trip to Machu Picchu.